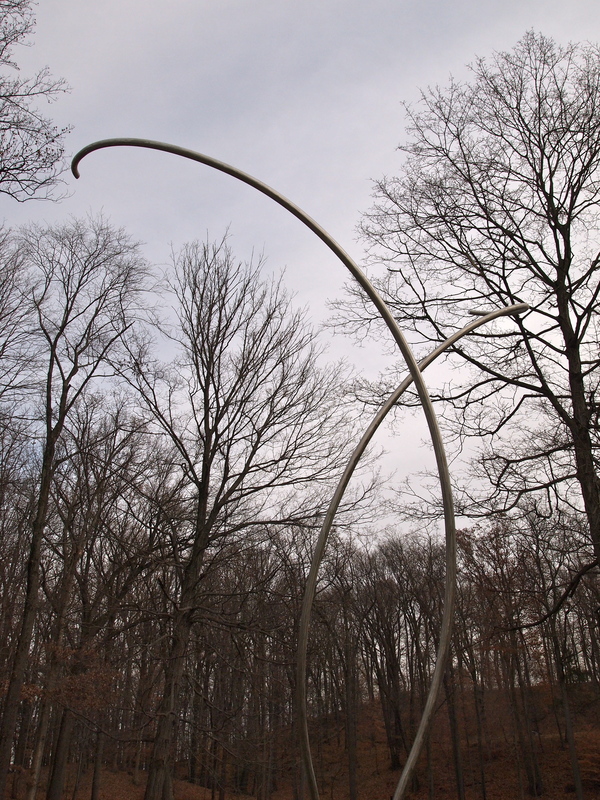 George Cutt’s Sea Change, the only motorized sculpture at the 500 acre Storm King sculpture park, twists and turns silently on itself like skeletons of two fern fronds. Calder Hill is stamped with Alexander Calder’s trademark geometric shapes, in bright red steel set against the green lawns leading up to Museum Hill. Down in the South Fields, behind the mirror-fence, a deer pauses to stare in at Zhang Huan’s huge Three Legged Buddha, whose face is half-submerged in the grass. 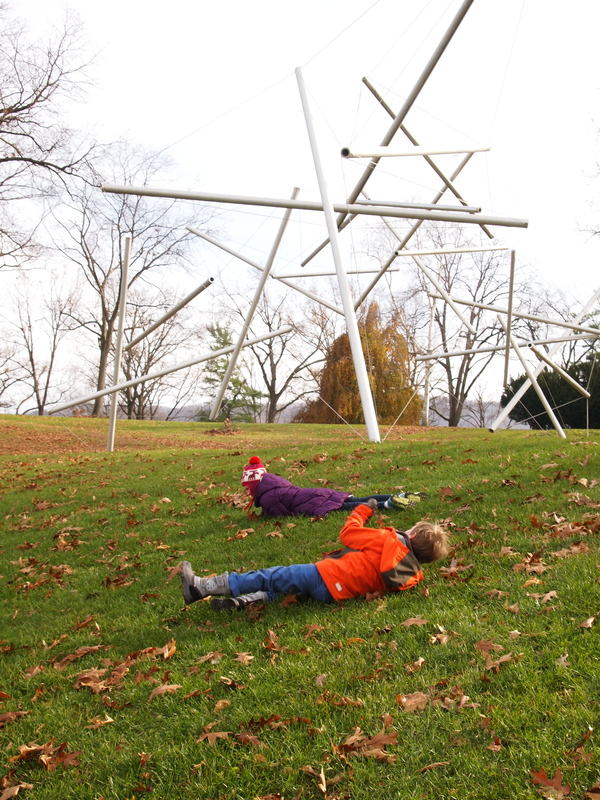 Emerging from under the spindly white steel web of Kenneth Snelson’s Free Ride Home, two very loud children roll down a steep hill, giggling hysterically while gathering momentum. There was no need to shush them. This was interactive art appreciation at its best. 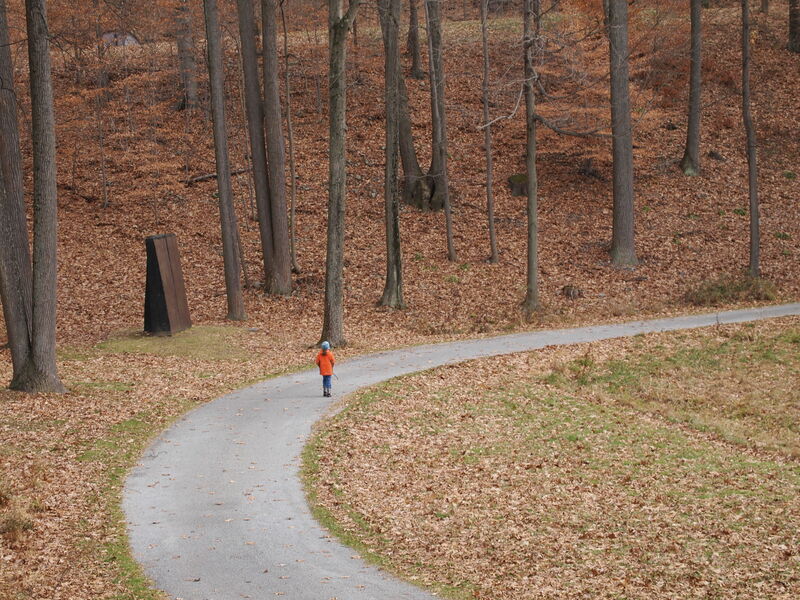 In fact it would have been remiss of us not to scramble up a leaf-covered hill in the North Woods and run, whooping down the other side – if only to be stunned into silence by the implausible balancing act of Menashe Kadishman’s Suspended. 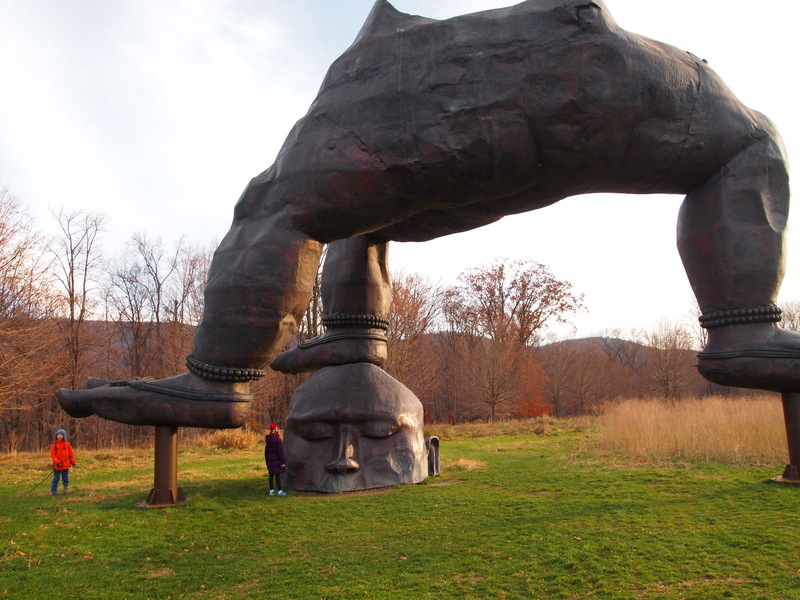 Set in the lovely Hudson Valley, an hour and a half north of New York, it’s a day-trip that puts art and nature in a whole new perspective as you run, walk and ride bikes under and around the more than 100 sculptures from artists including Mark DiSuvero, Andy Goldsworthy and Alexander Liberman. We managed to go last week just before it closed for the season. It will reopen on April 3rd, 2013. 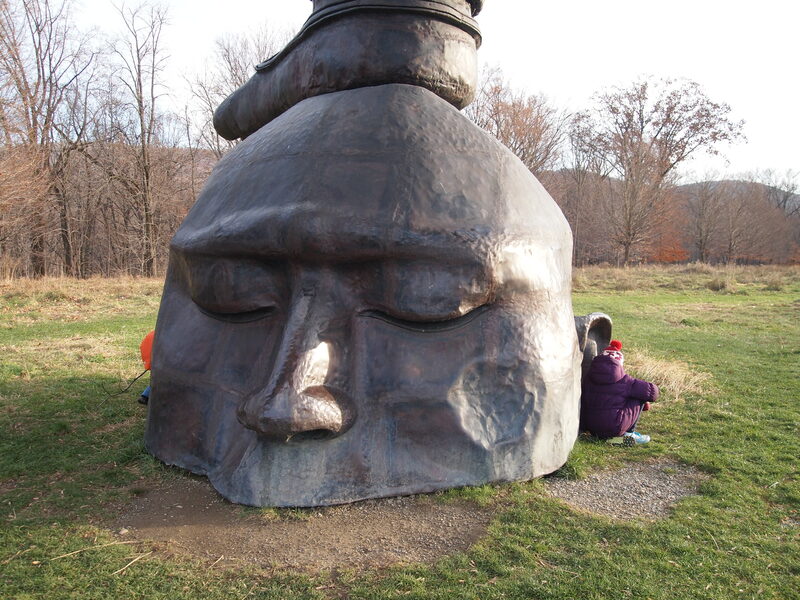 It’s impossible to imagine the park and its sculptures in anything but the burnt light of a Hudson Valley Fall. But we will be first in line in the spring to let it surprise us all over again – and to check on our own contribution to the park, a small shelter of fallen branches along the South Fields path called Surface, 2012. 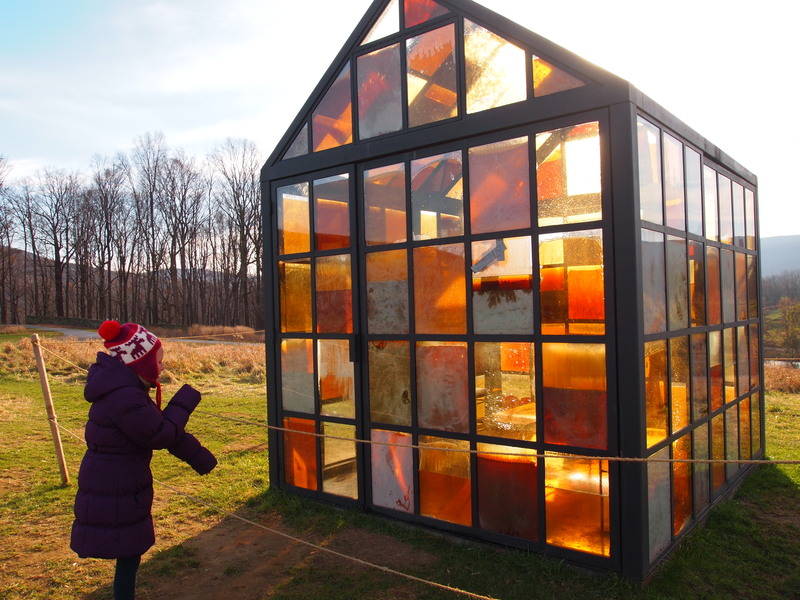 Liquid Light: William Lamson’s “Solarium” was part of this year’s Light and Landscape exhibition. Each pane of glass in this hut was filled with caramelized sugar. 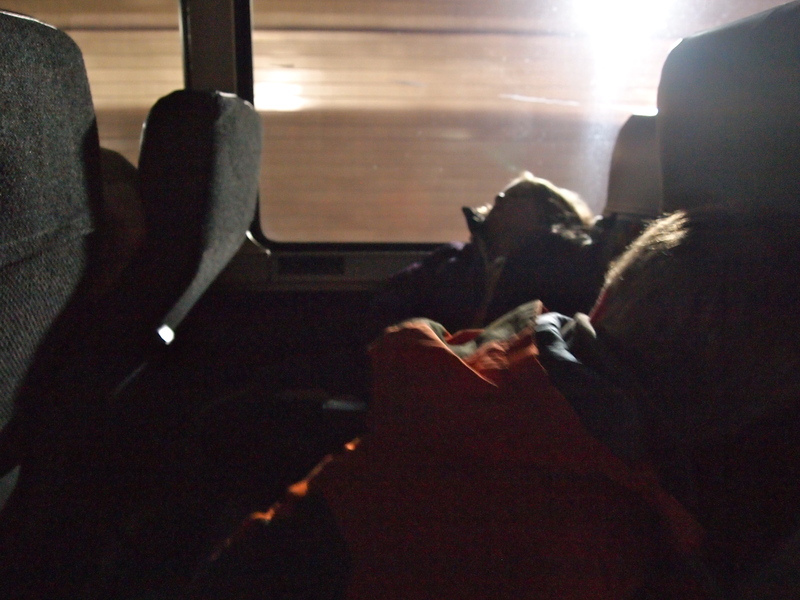 We took a day-trip package with Coach USA’s Shortline Bus from New York’s Port Authority Bus Terminal. The $45 ($22.50 for kids aged five and over) covers bus trip and the $12 entry fee ($8 for kids) to Storm King. Getting there was a breeze as the bus takes you directly to the door but with a 5pm pick-up time it’s not the most flexible option when you’re traveling with kids. I recommend a Zipcar rental for this trip. Sea Change is mesmerizing. I was drawn in by its graceful swerving arc through the air and Ruby loved the shape of “antlers”, made by the two poles as they swerved apart. The Three Legged Buddha: To all three of us, it looked creepy from afar but up close, its head looks like its basking in the sun, with half its face submerged in a still pool. 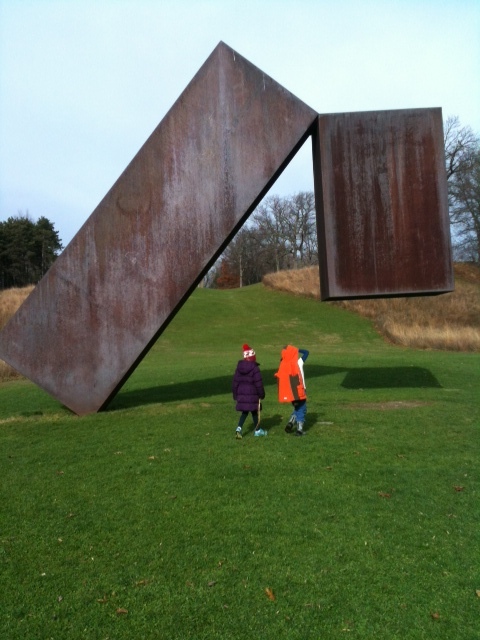 Mozart’s Birthday: Henry loved this enormous Di Suvero sculpture of industrial beams and a brushed steel pendulum. And that it came with a rubber mallet. Hit the brushed steel gong to make music. Momo Taro: Isamu Noguchi’s quiet white stone carving tells the story of a Japanese superhero, a little boy with superhuman strength who was found inside a peach. Children are encouraged to climb inside the peach – reappearing with superpowers is optional!